Pink lemonade is one of the best drinks for summer! Not only is it a refreshing drink but it’s also a delicious ingredient for pies, cookies and cupcakes. Have you ever tried pink lemonade cookies? How about pink lemonade icing? Oh, it’s so good! In this post I’m going to share three pink lemonade recipes with you along with pink lemonade party ideas and free party printables. A great way to wind down summer vacation would be to throw a fun pink lemonade party with your kids and their best little buddies. How adorable would a mini lemonade stand at the party be? You could use the free printable party supplies to dress up your lemonade stand along with yellow and pink paper lanterns. 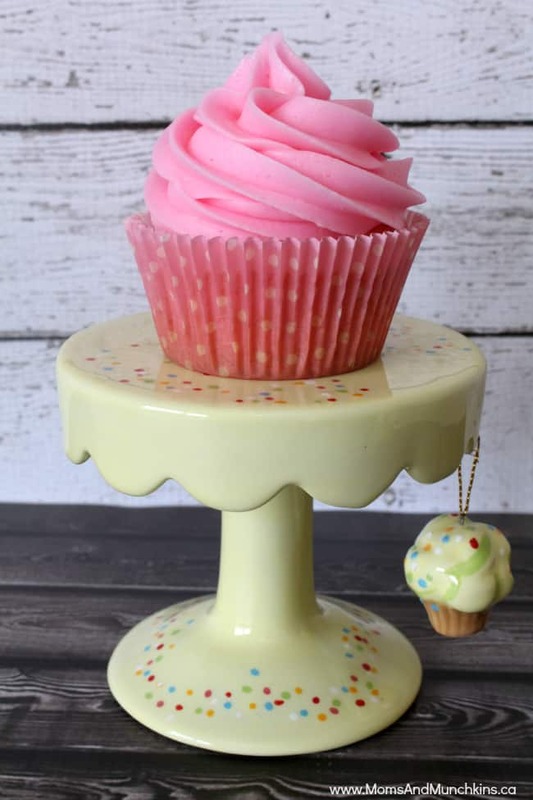 Alternatively, a pink table cloth with pink & yellow accents is just as cute! These adorable pink lemonade favor boxes are by Print Magic. 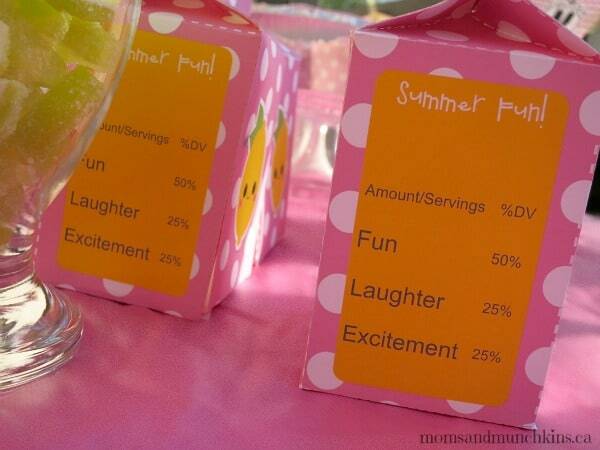 The favor box comes in a PDF file that allows you to change the message on the side of the box (I typed “Summer Fun!” on ours) and then you print as many as you need. 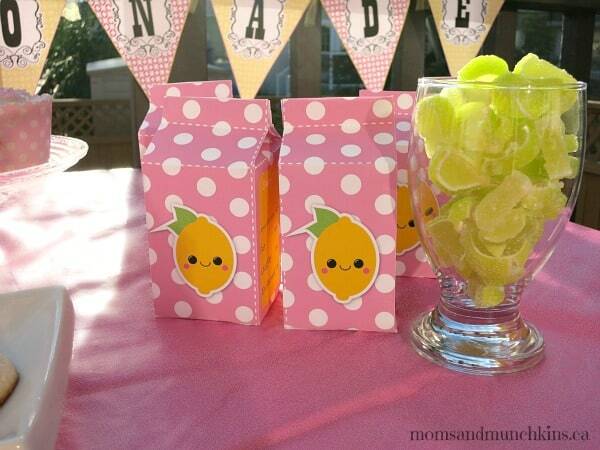 Pink & yellow candy or gummy lemon slices are a fun treat to go inside the favor boxes. I won’t tell you how many of these cupcakes I’ve already eaten! I think I’m addicted to the pink lemonade icing. It is so delicious! I made about 6 cupcakes and then turned the rest into a pink lemonade cake with the same batter and icing recipe below. Depending on the size of your cake pan, this needs to make for about 30 minutes (or until a toothpick inserted in the center comes out clean). The perfect combination of sweet & tart! This recipe makes 24 cupcakes. Heat oven to 350 F. Place paper baking cups into 24 muffin tin cups. In a large bowl, beat shortening on medium speed for 30 seconds. Gradually add sugar to shortening, beating after each addition. Beat 2 minutes after all the sugar has been added. On low speed, alternate adding flour mixture, milk and lemonade concentrate (about one-third at a time) beating until blended. Divide batter evenly in each muffin cup. Bake 18 to 20 minutes or until a toothpick inserted in the center comes out clean. Cool for 5 minutes in pan and then remove and place on rack to cool completely. In a large bowl, mix powdered sugar and butter and beat with an electric mixer on low speed. Stir in 6 tablespoons of lemonade concentrate. Gradually beat in remaining lemonade concentrate until you've reached the desired consistency. 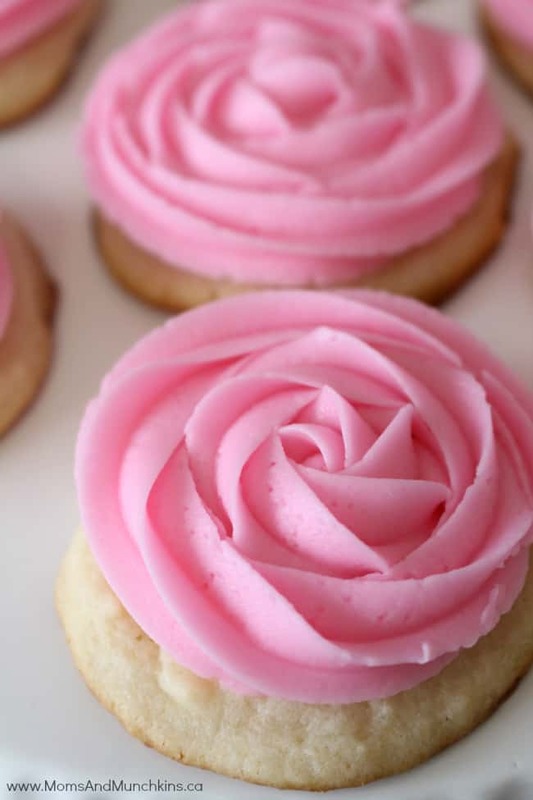 Frost cupcakes, sprinkle pink sprinkles on the top and serve. It’s always great to have a variety of desserts at a party so here’s another delicious suggestion for a pink lemonade treat! Keep a close eye on these while they are in the oven because they burn really quickly. A few additions to a delicious cookie mix and you'll have a new sweet & tart treat! Heat oven to 375 F. Line cookie sheet with parchment paper. In a large bowl, mix all cookie ingredients together with electric mixer on medium speed until well blended. Drop dough onto cookie sheet in rounded teaspoon sizes. Cool 1 minute then remove from cookie sheet onto rack to let cool completely. In a medium bowl, mix ¼ cup butter, 2 cups powdered sugar and 3 tablespoons of lemonade concentrate with electric mixer on low speed until smooth. Add remaining lemonade concentrate, one tablespoon at a time, until desired consistency is reached. Frost cookies and top with pink sprinkles. A delicious way to cool off on a hot summer day! 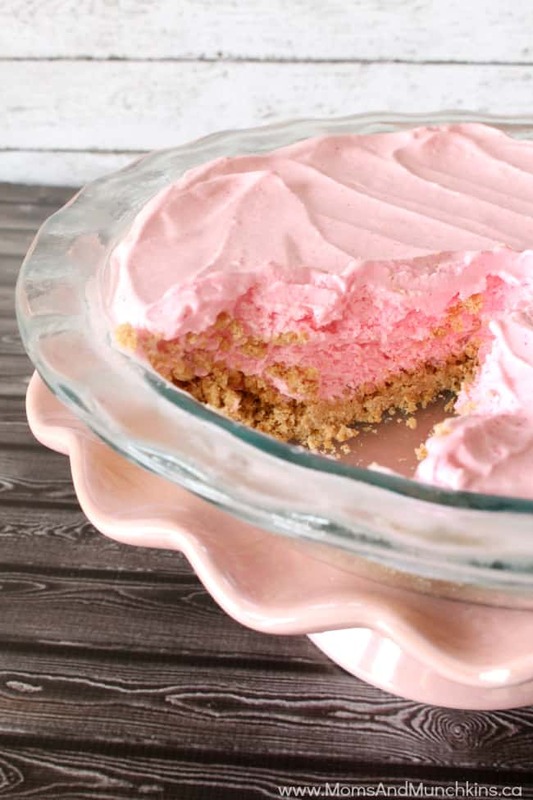 This pink lemonade pie is a refreshing way to cool off on a hot summer day. In a small bowl, combine all crust ingredients and mix well. Press mixture in bottom and up on side of a 9-inch pie plate. Chill for 30 minutes before filling. In a large bowl, mix ice cream, pink lemonade concentrate, whipped cream and a small drop of pink food colouring. Spoon and spread ice cream mixture into crust. Freeze until firm (about 4 hours). I hope everyone enjoys their last few weeks of summer vacation! If you try any of these recipes, I’d love to hear what you think about them in the comments below. OMG I absolutely LOVE pink lemonade! 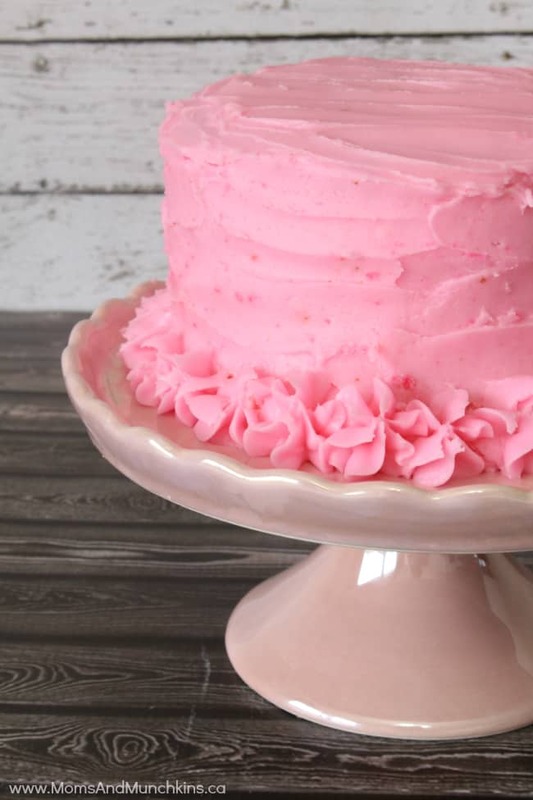 I’m going to have to try all these recipes..
Love the pink lemonade party theme, Cheryl!! Everything looks so yummy and your party decs are gorgeous! I’m tweeting and pinning!! Have a lovely day! That’s so sweet of you! Thank you so much! YUM!! Such a cute little party!! I love pink lemonade! What a great party theme! I love pink lemonade and all your treats make me want to go into the kitchen and start baking. Thank you for linking up to Simple Supper Tuesday. How pretty and my mouth is watering looking at those cupcakes. 😀 Thanks for sharing your pretty pink party inspiration on BeColorful this week. Yes, they certainly were mouth watering! I’m not sure if my husband even had a taste of them! I love all things pink lemonade 🙂 This is such an adorable idea and the printables are darling! Thank you so much for linking all this up! Have a delicious week! Wow, I love it all! 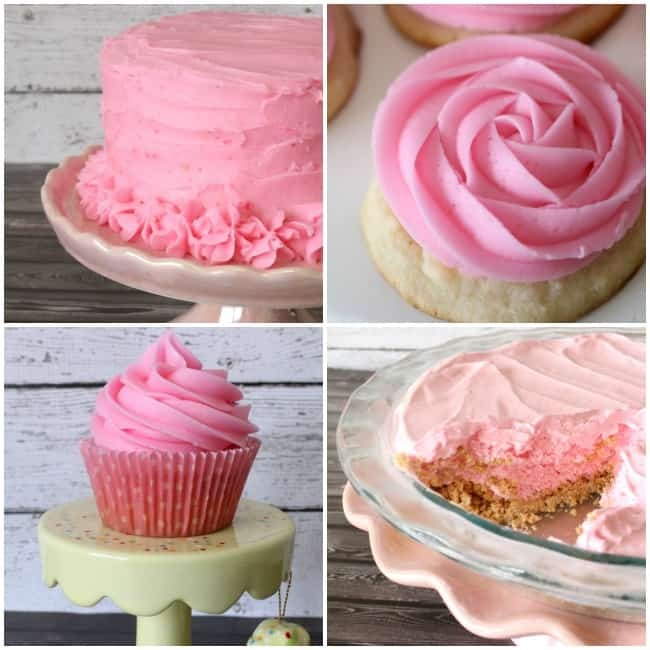 I’ve never tried pink lemonade cookies, so I got to give it a try 🙂 Thanks so much for sharing all these great recipes and party ideas at the Less laundry, More Linking party. Thanks for stopping by! Oh, you’ll love that pink lemonade icing.